Garl Glittergold is the patron deity of gnomes and his symbol is a gold nugget. He is the most popular of the gnomish deities, and honored, in one way or another, by nearly all gnomes. Garl is depicted as a handsome, golden-skinned gnome with sparkling gemstones for eyes. He wears a flowing silk cloak and usually a substantial amount of gold decoration. Garl, as god of Luck and Trickery, leads the gnomish pantheon. He is the arch enemy of kobolds and their patron deity Kurtulmak. Garl lives in the gnomish realm of the Golden Hills on the plane of Bytopia with the other gnomish gods and goddesses: Baervan Wildwanderer, Baravar Cloakshadow, Flandal Steelskin, Gaerdal Ironhand, Nebelun, Segojan Earthcaller, and Urdlen. The Golden Hills are a set of seven hills, one for each of the deities who dwell there. The whole realm glows with a golden hue. Garl’s hill is known as Glitterhome, but he prefers to wander throughout the realm, often in disguise. Garl Glittergold has a twin brother (and nemesis), Gelf Darkhearth, his rival for the hand of the goddess Sheyanna Flaxenstrand.Garl is on good terms with Aasterinian and Pelor and allied with Yondalla, Corellon Larethian, and Moradin. He is also allied with Brandobaris, Clangeddin Silverbeard, Cyrrollalee, Dumathoin, Erevan Ilesere, Grumbar, Vergadain, and all of the gnomish pantheon except for Urdlen and Gelf. Garl’s enemies include Kurtulmak, Urdlen, Gelf, Gruumsh and the other orc, kobold, and goblin gods. Gnomish communities who follow Garl all follow a similar philosophy. A sense of humor is an important thing for anyone to cultivate, regardless of their hardships. The inhabitants of a community ought to cooperate for the greater good. Pranks are a sacrament. Authority figures shouldn’t take themselves too seriously. The tales and jokes of the gnomish people should be preserved, but change should not be feared. Garl clergy wear war helms and gold belts. On ceremonial occasions, their helms and armor are plated with gold as well. Novice priests are known as the Uncut, while full priests are called Jewels. The ranks in Garl’s hierarchy are, in ascending order, the Amethyst, Topaz, Opal, Jacinth, Diamond, Emerald, Ruby, and Sapphire priests. High priestesses are called Star Rubies while male high priests are called Star Sapphires. Specialty priests are called glitterbrights. Priests of the Sparkling Wit serve as crafters, teachers, goldsmiths, miners, entertainers, mediators, councilors, and protectors. They defend the community against outside threats, often with axes, their god’s favored weapon. Temples to the Priceless Gem are unassuming and often hidden. They are normally worked caves just beneath the surface, in the heart of a gnomish community. They are usually circular with a domed ceiling divided into four quadrants, the walls and ceilings decorated in gold leaf and studded with gold nuggets when this can be afforded. Comedians, illusionists, and other entertainers use the space to bring joy and laughter to the faithful. Priests there are usually glad to help traveling gnomes in need. Ceremonies in honor of Garl are flashy, full of illusion and mystery. They extol gnomish virtues such as cleverness and craftsmanship. During the Communion of Laughter, the faithful are expected to sacrifice a bit of gold or gold dust to the church, who use it for the good of the community. Prayers to Garl are typically composed in call-and-response style, with the priest asking a riddle and the flock calling out the answer. Worship services are held on the 13th of each month in a holiday known as the Communion of Laughter. Lasting the whole day, the Communion of Laughter includes quiet contemplation, prayer, communal eating, dancing, storytelling, and joke-telling contests. The gnomish gods were born as gems or veins of precious metals in the heart of the world, some say. Subterranean waters slowly eroded the earth around them until they were free. While most gnomes imagine the multiverse as a steady-state model with no beginning or end, there does exist a myth of the ever-curious Garl Glittergold descending into a limestone cave system and being alerted to the presence of a hidden cavern by his intelligent axe, Arumdina. Using his magic to enter the cavern, Garl discovered it was covered wall to ceiling with brilliant gems. Picking some of the gems out of the wall and breathing on them, tiny forms within the gems were set free, becoming the first gnomes. 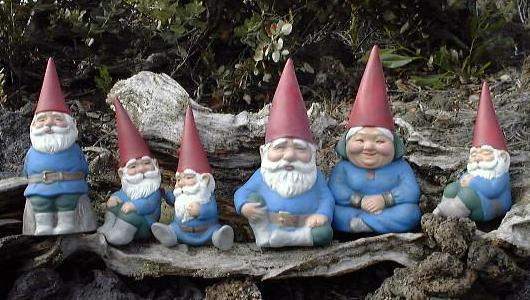 Some believe the svirfneblin came from rubies, the rock gnomes came from diamonds, and the forest gnomes from emeralds. In other versions of the myth, a handful of the tiny forms are blown into the air by a sudden upcurrent, and they become the ancestors of some minor faerie folk. Usually, the first thing Garl does after setting the gnomes free is tell a hilarious joke. Dwarven legends claim that Garl was once a dwarf god of magic called Garal, who drew away a portion of the dwarven people and remade them to suit his needs, thus creating the gnomish race. There was a time when all was harmonious and good. But then Garl Glittergold noticed a disharmony, a dissonance, the sound of a being at odds with all existence. He investigated the sound, and after traveling for days in the space of an instant he discovered his counterpart, Gelf Darkhearth, who was exactly the same height and shape as Garl, even dressed the same as Garl, but with gray skin and black hair. The terrible sound emanated from Gelf’s weapon, which was a thing of chaos, neither musical instrument nor sword nor wand but all of these things, shifting from one to the other. The two discovered they knew everything about one another, and that they were fated to battle eternally, Garl’s sword against Gelf’s thing, and so they do, because their ways are antithetical to one another. Their battle is the battle that goes on within every gnome’s heart between peace and tranquility and the desire for rebellion and change. It is the battle of the multiverse itself, creation balanced against destruction. The gnomes of Gaborren’s Rift in the Grandwood forest have a unique myth in which Garl directly battles the orcish god Gruumsh, doing more than deploying mere tricks and illusions, but attacking him with the desire to kill. According to legend, Garl collapsed the cave-system hall of Kurtulmak. The circumstances of this are debated, but most gnomish legends say that Kurtulmak had ambushed and bound Garl, while Garl only pretended to be bound securely in order to play his prank. According to another version of the myth, the Sparkling Wit snuck into Kurtulmak’s throne room and created a structural defect in the ceiling. Kurtulmak was entertaining the arch-devil Asmodeus when the roof came down on them both. The archdevil, believing this had been an assassination attempt, suspended Kurtulmak over an active volcano by his tail for a week.